Nasturtiums can add an interesting splash of color to the garden… and then you can eat them! The leaves and flowers of this pollinator-friendly plant are completely edible, with a delicious peppery taste. The leaves and flowers can be used not only to add a spicy note to salads, they can also be used as a base for pesto or chopped and added to cheese spreads, salsas and virtually any kind of sauce. Or, use them to construct yummy, fancy tea sandwiches. You can also pickle the buds or immature seed pods for use as a substitute for capers. Nasturtium—Tropaeolum majus—is an annual flowering plant and member of the Tropaeolaceae family It’s also known as garden nasturtium, Indian Cress, Mexican Cress, and Peru Cress. The genus name comes from the Greek and Latin words for trophy, owing to the flowers’ resemblance. Nasturtium means “nose twister” in Latin relating to the flower’s spicy taste. Nasturtium originated in the Andes, starting in Bolivia and then spreading north to Colombia. It has become naturalized in large parts of the United States and Europe and is represented by more than 100 varieties. Ideally full sun but they can tolerate some shade, though they won’t bloom as well. Keep nasturtiums consistently moist until established; mature plants can tolerate brief dry periods. As always, take care not to over-water when the seeds are first planted. Similar to most plants, early morning watering is best. They do not need fertilizer—it will only cause them to grow more foliage (vs. flowers). Not necessary though it can be used to discourage weeds. Resistant to pests and diseases. They can be used to lure aphids away from other susceptible plants. It’s so easy: just pick the leaves and flowers as needed. Beautiful, easy, eco-friendly, and fast-growing, these are a colorful garden favorite. Nasturtium leaves and flowers are edible—prized for their peppery taste. Important pollinators such as bees, hummingbirds and butterflies LOVE these flowers. With their interestingly-shaped and vividly-colored flowers and foliage, they add an interesting note to any flower bed or container. 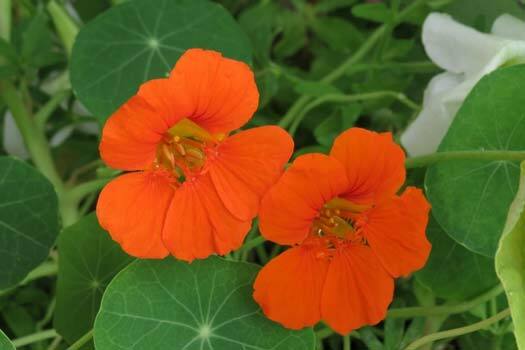 You generally won’t find Nasturtium plants in a nursery; they must be grown from seed. Our product offering—Jewel Mixed Color—is a popular heirloom seed variety. Nasturtiums contain important nutrients such as vitamin C and iron.